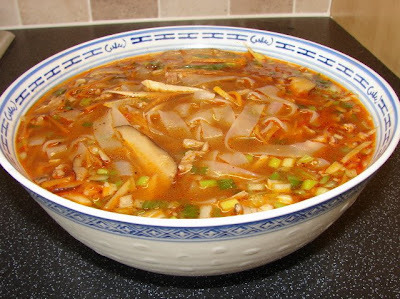 Hunan hot & Sour noodle soup is very similar to Sichuan hot and sour soup. This soup is not thickened with cornflour but rice noodles are added to bulk up the soup. Either serve this as soup with a meal or full meal on its own. Quick and simple recipe. This recipe is enough for 2 -3 as full meal, or 4 people as a meal with other dishes. Marinate pork with soy, cornflour and wine for about 20 minutes. Fry the garlic with a little oil, then add pork stir till turning brown then add chilli bean sauce and fresh or bottled chilli paste/sauce/minced chilli. Stir fry till fragrant. Add mushroom, carrot and bamboo shoot, stir then add stock/water and stock powder. Bring this to the boil. Add soy, vinegar, sesame oil and ground pepper. Add the dried noodles straight in the soup without soaking. Boil till noodles beginning to soften. If using pak choi add this now. Continue boiling till noodles and pak choi are cooked. Add in spring onion. Ready to eat. Brilliant one sunflower, that's dinner sorted for tonight. That looks absolutely delicious Sunflower. I can't wait to try it. Had a blonde moment! I thought you were talking about the chicken salad and had commented on that instead of this post (doh)! Thank you for reading and leaving your comments or suggestions. Spam or link to suggested sales will be removed. Spams or sales will be disregarded. Chinese brought up in Brunei now living in UK. Love food especially S E Asian. Useful to print out the Chinese characters if you take it with you to the Chinese supermarket to ask assistance to find an ingredient.